HELP PCS/WCDMA 3.4 V/29.5 DBm Linear Power Amplifier Module The AWT6276 meets the increasing demands for higher output power in UMTS handsets. The PA module is optimized for VREF = +2.85 V, a requirement for compatibility with the Qualcomm 6275 chipset. The device is manufactured on an advanced InGaP HBT MMIC technology offering state-of-the-art reliability, temperature stability, and ruggedness. Selectable By Anadigics, Inc. This is one package pinout of AWT6276R,If you need more pinouts please download AWT6276R's pdf datasheet. 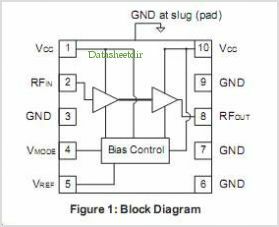 This is one application circuit of AWT6276R,If you need more circuits,please download AWT6276R's pdf datasheet.